So many books, so little time. How do you decide what to read? Walking into a bookstore, a library, or looking online can be an intimidating and overwhelming experience, to say the least. With so many options and not knowing what's best for you, it's easy to just end up making an impulse buy or giving up on reading altogether. We barely spend as much time reading as we'd like, and then we often end up completely frustrated by what we chose to read. 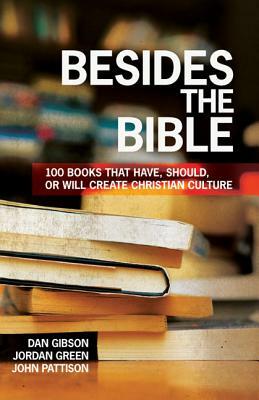 Besides the Bible is a guide to the really great books that you should read--ones that matter. Covering a wide array of subjects and authors, from Christian bookstore best sellers to classics of Christian history and more, you'll find yourself agreeing with some titles, shaking your head at others, and even shocked by a few. This isn't a dry catalog with dull summaries of books authored by a bunch of dead guys. Dan Gibson, Jordan Green, and John Pattison, along with an all-star team of today's most interesting Christian thinkers--including Donald Miller, Derek Webb, Phyllis Tickle, Steve Taylor, and William P. Young-- will re-ignite your love for reading or if you're a little lazy, give you enough information to make it seem like you're incredibly well read.